Sometimes you just want to clean up a little spill. If you have children or pets or high-traffic zones that stain easily, you may be very well acquainted with this desire. Instead of pulling out the carpet cleaner to freshen up a small area, try one of these portable spot cleaners. Let’s take a look at them both to see which is the best for you. bottle of their Professional Deep Cleaning formula in the box. The clean water tank holds ¾-gallon so you don’t have to refill it in the middle of your task. Choose either the 6-inch stair tool or the 3-inch tough stain tool and attach it tothe flexible hose. The large carrying handle and the 22-foot long power cord make it possible to move this 17-pound portable cleaner where you need it most. Plus, it measures just 10 by 14 by 14 inches so it’s very compact. The SpotClean Pro injects the cleaner into the carpet or fabric you’re cleaning, then suctions it out to lift up debris and dirt. Once you’re done, just empty the tanks. The recovery tank where the dirty water collects is easy to clean. Many of us have used a Rug Doctor before. They make carpet steam cleaners that many stores rent out for home use. Now you can have the same convenience in a portable size for spot cleaning. The Rug Doctor Portable differs from the Bissell 3624 in a few key ways. One, it has a motorized brush that scrubs tough stains for you. Two, you can turn off the motor to the brush if you’re scrubbing something delicate. And three, it has wheels, and that fact alone makes this 20-pound cleaner truly portable. 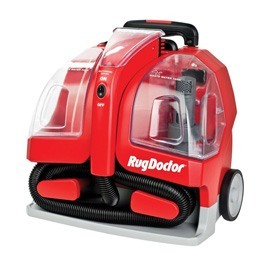 Besides the wheels, there is a retractable handle on top of the Rug Doctor. It’s also designed to fit on a step without hanging over. 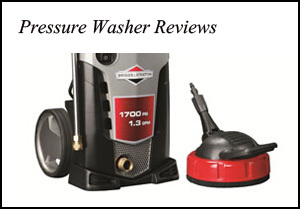 Although the cleaning solution and recovery tanks are only ½-gallon, smaller than the ones on the Bissell, they are easy to remove and clean. At 5-1/2-feet, the flexible hose on the Rug Doctor is longer than the one on the Bissell. And while the power cord, at 15.09-feet, is shorter, it’s retractable for neat storage. There’s only one thing to keep in mind with both the Rug Doctor and the Bissell 3624. They both make quite a bit of noise when they’re working because of their powerful vacuum motors. Sometimes we make choices based on price, but sometimes there’s not enough of a difference to help us decide. Who knew that a portable spot cleaner could be so hard to select? But let’s review the things that make these two models different from each other. The Bissell 3624 has a shorter flexible hose, but a longer power cord. It doesn’t have wheels but it’s lighter and more compact than the Rug Doctor. It comes with two attachments but neither of those is motorized. The water tanks are .25-gallon larger. If those seem like features suited for your needs, get this portable spot cleaner. The Rug Doctor is splashproof so you can use it outdoors to clean your car’s upholstery or deck furniture. It has a 5.5-foot long hose with a motorized brush tip, but you don’t need to use the motor to scrub if you don’t want to on delicate fabrics. While this machine is heavier, it comes with a retractable handle and wheels so you can roll it like a dolly. The water tanks are smaller so they weigh less when full. This makes the Rug Doctor especially nice for folks with some mobility impairment. 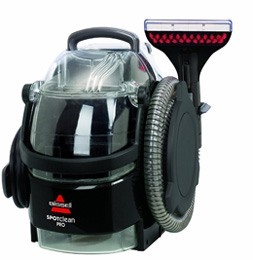 Click here to purchase Bissell 3624 on Amazon.com! Click here to purchase Rug Doctor Portable Spot Cleaner Machine on Amazon.com!